Product #15925 | SKU PT-ELITE-RC | 0.0 (no ratings yet) Thanks for your rating! The Elite iPad Teleprompter Kit with Elite Remote by ikan is a complete out-of-the box solution that turns your iPad into a field-ready teleprompter. 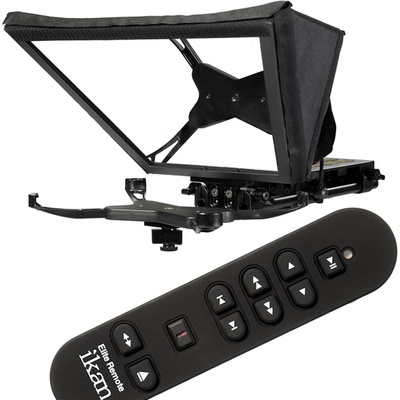 The teleprompter kit provides you with the ikan Elements 15mm LWS rod support system and adds a portable through-the-glass teleprompter that is compatible with the iPad, iPad 2, and iPad 3. This bundle from ikan also includes the Elite Remote, which connects to your iPad using Bluetooth 3.0, and features a laser pointer, mirror flip button, two cue points, and four speed control buttons. The remote also features a twenty-foot range and controls the prompter using your favourite available iPad compatible teleprompter application. The Elite iPad Teleprompter Kit by ikan is a handy way to make use of your iPad in your video production workflow. This plug-n-play uses ikan's Elements camera support with a sturdy prompter hood to function as a through-the-glass teleprompter or a rod-based camera support by using only the included base plate. The system is compatible with DSLR and small to mid-size video cameras used with the iPad or iPad 2 and any iPad software application. It includes an EV2 Adjustable Camcorder Baseplate, 12" (30.5 cm) rods, 30/70 prompter glass with frame and an adjustable iPad mount. The ikan ELITE-REMOTE is compatible with dedicated 3rd-party prompting apps that were designed for the iPad in partnership with ikan. The remote connects to these apps over Bluetooth 3.0 and works from up to 20 ft away. ELITE-REMOTE features 9 rubberised, soundless buttons and a laser pointer. It connects seamlessly with your iPad by three simple steps: 1) turn on the remote, 2) click the "sync" button, 3) and pair with the iPad. A pouch with a zipper is included for comfortable carrying. Compatible with DSLR and small to mid-size cameras such as the Canon 5D DSLR and XF105 and XF305 video cameras.